Bede (ca. 673-735), star author of the twin monastery of Monkwearmouth-Jarrow, is most famous for his 'History of the English Church and People'. Today it is known for Bede's acknowledgement of his sources: he gave footnotes saying where he got his information. He wrote it around 731 for the saintly but ineffective Ceolwulf, King of Northumbria, who was in that year forcibly 'retired' and tonsured as a monk, although he soon returned to the throne. In the book, Bede tells the story of the Anglo-Saxons becoming a Christian people and, although politically still divided into several kingdoms, united in destiny as a nation. It remained a best-seller for a few centuries. 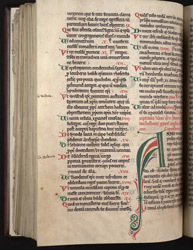 This 12th-century copy, made at Kirkham Abbey, Yorkshire, was included in a manuscript containing other works of Bede, histories, and material on saints. Bede wrote his history in five 'books'. On this page, the listing of chapter titles and numbers for Book 4 ends and Chapter One, Book 4 begins with the large green letter A. The year is 664, the famous Council of Whitby has just decided in favour of the Roman date of Easter and the Irish abbot of Lindisfarne, Colman, has departed. The narrative takes up other events in 'the year of the eclipse and the pestilence which followed'.